Brief Description: Do you like British boy band The Wanted? Have you followed their career from when they first formed in 2009 through to the current day? Would you like to find out more about Max, Siva, Jay, Tom and Nathan? If you answered yes to any of these questions, 101 Interesting Facts on The Wanted is certain to appeal to you. Do you know who is the oldest member of the group? Which artist did The Wanted support on tour in Brazil? What member of the band originally came up with the name, The Wanted? The answers can all be found inside this book, together with many more fascinating facts about your favourite band. Fun and informative, this book includes many personal details about the individual band members as well as up-to-date information about The Wanted’s projects, past and present. Gen up on The Wanted so that you can impress your friends with your knowledge. 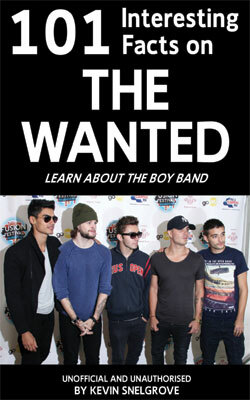 If you are a fan of The Wanted, you won’t want to be without this book. About the Author: Kevin Snelgrove was born in Frome, Somerset, in 1960. A prolific author, Kevin has written over 70 books on a range of subjects, including football, sport, television, film, music, health and leisure. Many of his books have been endorsed by celebrities and sports personalities such as Richard Wilson, Nicholas Parsons, Fennella Fielding, Ian Holloway and Neil Warnock. Kevin has also recently taken up acting and was involved in the 2012 film The Seasoning House with Sean Pertwee. During his career, Kevin has appeared in TV, radio, DVD and in numerous newspapers and magazines. Having worked with people with Autistic Spectrum Disorder (ASD) for 35 years, in 2013 Kevin decided to use his experience to benefit others and wrote a book about the subject. Kevin lives in Frome with his wife Julie. He has four children; Samantha, Kate, Charlotte and Samuel, and a grandson, Reuben.